A UCLA professor is urging those who "have a Jewish-sounding name" to lobby their senators against a new bipartisan measure that would level sanctions on Iran. 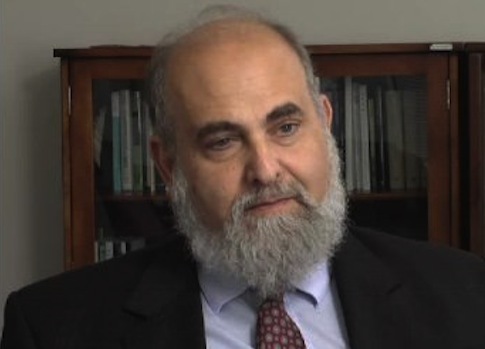 UCLA professor of public policy Mark Kleiman took to his Washington Monthly blog on Wednesday to urge his readers "to yell at Senate Democrats who support the Iran sanctions bill," which he characterized as a "lunatic piece of warmongering legislation." Kleiman, a frequent contributor to Washington Monthly, said Jewish voters hold the key to convincing Democrats to reverse their support of the bill. "Please consider making your voice heard especially strongly if you’re Jewish, or have a Jewish-sounding name," wrote Kleiman, author of the book Marijuana. Kleiman provides a form letter that his readers with "a Jewish sounding name" can use when they fax their senator. "President Obama and Secretary Kerry seem to have pulled off a diplomatic miracle by negotiating Iran out of its nuclear-weapons progam [sic]," the letter states. "Please refrain from making their job harder." Asked by the Washington Free Beacon to clarify his call for those with "a Jewish sounding name" to join the pro-Iran lobbying campaign, Kleiman lashed out at Jewish casino magnate Sheldon Adelson. "There's a carefully cultivated misimpression that warmongering with respect to Iran is popular with Jewish voters, while in fact it's popular only with Sheldon Adelson," Kleiman wrote via email. "So it's especially important for politicians to hear from Jewish constituents who prefer the good outcome offered by the Obama/Kerry approach to the bad one sure to result by deliberately torpedoing an amazing diplomatic success." Pressed in a follow-up email to explain his reliance on non-Jewish people who may have a "Jewish sounding name," Kleiman again lashed out at Adelson, who donates to many pro-Israel causes. "Because – given the false impression cultivated by Adelson's money – an email from someone named Shapiro has a surprise factor not generated by the same email from someone named O'Hara," wrote Kleiman, who also blogs for "The Reality-Based Community." When asked by the Free Beacon to provide some examples of "Jewish sounding" names, Kleiman recommended that a reporter "go play in traffic." "OK, I've played your silly game long enough," he wrote. "Please take your concern trolling with you and go play in traffic." It remains unclear if Kleiman is Jewish or just has a "Jewish sounding name."